Israeli soldiers abducted, Monday, two Palestinian children from the al-‘Arroub refugee camp, north of Hebron, in the southern part of the occupied West Bank, in addition to a young man in Qalqilia, in northern West Bank. Media sources in Hebron said the soldiers violently searched and ransacked many homes, and interrogated the residents, while inspecting their ID cards. 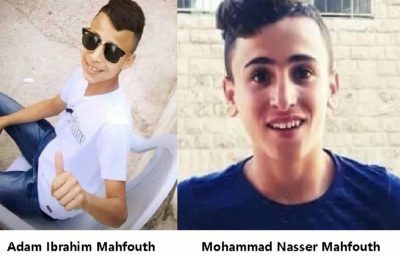 They added that the soldiers abducted Adam Ibrahim Mahfouth, 15, and Mohammad Nasser Mahfouth, 14, and took them to a nearby military base. The soldiers also closed the main entrance of Palestine Technical University – Kadoorie, al-Arroub branch, preventing the students from entering it to take their final exams. In Qalqilia, in northern West Bank, the soldiers invaded and searched several homes, including the homes of two former political prisoners, identified as Abdul-Nasser ar-Rabie and Sameh Affana, before abducting the latter. In addition, the soldiers assaulted and abducted a Palestinian employee of the Waqf and Islamic Endowment Department in the Al-Aqsa Mosque, in occupied East Jerusalem, and took them to an unknown destination.